The idea for this page is to provide local examples of backyards that are attractive to bird life. There is lots of general information on the web about attracting birds to a yard. We would like our site to provide local ideas for attracting birds specific to the Inland Northwest. If you would like to "show off" your yard, please consider sending pictures with accompanying text of plants, shrubs, trees, water gardens, birdbaths and other ways that you are using to successfully attract birds to your yard. To find out how to contribute contact us. The following contributions - photos and commentary - are from Jeanne Dammarell. Birds are first and foremost, either carnivorous or omnivorous. People think of them as feathered bambi but they are actually lions of the air. If we want to promote birds, we have to promote insects. Native plants are important for the staggered flowering and fruit production times, but their primary importance to birds is their role of host to a wide variety of insects that birds feed upon. While it is interesting to provide hummingbirds with a sugar water treat, they won't come and raise their families unless they have access to insects for the high protein diet their babies require. So we need a campaign to "Save our Tree Stumps” and "Save Our Bugs!" The formula to do this is to diversify your plantings, put away the bug spray, let some flowers go to seed and don't remove so much material from the ground. The lock on the suet feeder is necessary to keep the raccoons out. Otherwise, they simply remove the cake and walk away with it. These birds are feeding on the aphids that hatch on our native Golden Currant bushes. This bush is very ornamental, produces beautiful yellow flowers in early Spring when the Hummingbirds first arrive, has berries that are prized by the birds and insects that supply protein during nesting season. The insects never do any real damage to the bush. Yellow Golden Currant blossoms, attract praise from bees, hummingbirds and people. The Golden Currant grows no higher than six feet and is excellent for city gardens. The Goldfinch was folding the leaves back with a foot to expose the aphids underneath. What fun to watch! I have a variety of feeders in my yard, to meet the needs of different birds. This small, simple feeder filled with whole black-oil sunflower seed is a favorite among the Chickadees, who like to grab one seed at a time and take it elsewhere to eat. The feeder was installed in a Crabapple tree to provide the small Chickadees with a place to feed without the frenetic intrusion of hordes of Finches. As it happens, visiting Red-Crossbills, Pine Siskins and Evening Grosbeaks also prefer the full sunflower seed in the shell and are happy to use the Chickadees 'special feeder'. Calliope Hummingbird on favorite Bee Balm blossoms (Monarda species) and Black-capped Chickadee feeding on the seeds of the Bee Balm. All species of Bee Balm are extremely attractive to Hummingbirds. If the gardener refrains from removing the dead blossoms they will enjoy watching Chickadees and Goldfinches feed on the seeds. Bee balm is a member of the mint family and is more deer resistant than most plants. Native plants provide a staggered schedule of ripening that works to the advantage of birds and other wildlife. Golden currents and Serviceberry are among the earliest to bloom and produce ripe fruits followed by Red-stem Dogwood and Hawthorne. This young Cedar Waxwing is perched in August on the fruit of our native Elderberry which ripen in late summer. The Pine Grosbeak is still feeding on very ripe Serviceberry in the November. This clever Pileated Woodpecker perched on a favorite dead Aspen stump to access the berries from native Red-stemmed Dogwood in July. Many miles of new fencing have gone in on the public lands around Telford following the wildfires. 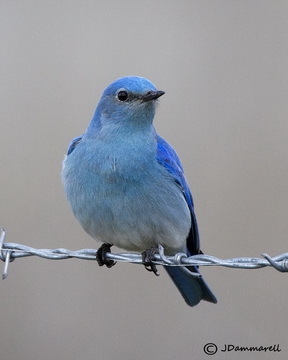 I've attached a photo of a Mt Bluebird sitting on the new fence and remnant guide string is evident at his feet. It doesn't seem to be there on all stretches of the fence, but it does appear frequently. It looks to me like something that can entangle birds easily and should be removed. I just put a pocket knife in my camera bag. Baling twine can be found all over the place and it is a definite hazard for birds and it too should be removed. Any time you are in the field, just pick it up and put it in your car for later disposal. 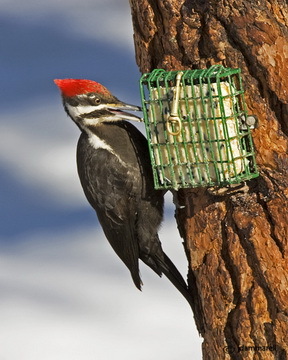 Open trays allow a greater variety of birds to feed and when shelled and broken bits of sunflower seed are displayed, even the woodpeckers will come. These trays have removable screens that can easily be cleaned. Mounted on metal poles with squirrel baffles installed midway up to prevent squirrels and raccoons from accessing. These trays are six to seven feet above the ground to prevent white-tailed deer from licking the seed out. Anyone living around bears must bring bird feeders in at night. Two trays stacked atop one pole. These systems attract Finches, Nuthatches, Hairy and Downy Woodpeckers, Northern Flickers, Pileated Woodpeckers, three varieties of Nuthatches and two types of Chickadees. Two, undoubtedly related Calliope Hummingbirds, share a sip from one opening on a feeder. Every source we can find discourages the practice of using sugar water with red dye in it. The stores persist, but the recommended feeder solution best to offer to hummingbirds consists of boiling water and sugar in the ratio of one fourth cup of sugar to every cup of water. It is important to keep these feeders clean and to watch for the development of bacteria during slow times at the feeder. It is recommended that people use small feeder brushes (available at bird supply stores) to clean it out, followed by a soak in a solution of one part bleach to ten parts of water. Feeders must be thoroughly rinsed after such cleaning. ﻿Avoiding yellow jackets: be very careful not to slosh any solution from the feeder when replacing it after filling. Any solution on the outside of the feeder will attract yellow jackets wasps. Ants can be prevented from accessing the feeders by using petroleum jelly on either the pole the feeder is hanging from or on the feeder's cord. A small area will do, since it is designed to discourage them from crossing. Suet feeders are enormously popular year around with Nuthatches, Woodpeckers, Chickadees and more. Suet cages here are attached firmly the tree with a metal strip and nails. The opening at the top is locked to prevent squirrels and raccoons from taking the entire cake as a personal prize. Where these animals are not an issue, imaginative birders have used other types of cages found around the house to hang suet from trees. It is not unusual to see several birds lining up to await their turn at the suet. Here two Pileated Woodpeckers are at the feeder and in the second shot a Starling can be seen waiting lower down the tree. This birdhouse, opened for cleaning following the successful fledging by a family of Tree Swallows. The hinged door allows easy access for seasonal cleaning. The metal cover around the bird's access door prevents squirrels and woodpeckers from enlarging the entrance. This house is mounted on a metal pole to make it more difficult for snakes and squirrels to access. Never buy a birdhouse that does not have a hinged side to allow access for cleaning. Parasitic insects enter the nests and feed on baby birds, so it is important to clean out all nest material between broods so that any insects and their eggs are removed.